The latest changes are 'added some ignore keys' - Speaks volumes! Grab the Portable Version if you need a dabble..!! in the hands of the Unknown..!! I took a snapshop (RollbackRx). Ran "MY" reg cleaner, then "THIS" one. ALL these Damn Reg Apps use different Algorithms. DO NOT be taken by Them. FIND yourself a Reputable Registry cleaner (IF YOU MUST) & stick with It. Trying Different Reg Apps, & Removing what they find .. WILL .. Screw your System. Stay Away from all these Registry & Sys Tune-up Apps. Grrrrrrr.!! 2* ... For being an Alternative System Killer................. "Stay Safe Guys"
Been using this great little util for a while now. Managed to fix a few problems too. Well worth downloading. My only problem with it is that its still not portable. Author, this is the portable age, installation is old fashion, get that fixed and you get the extra 2 stars. Stay away from registrycleaners, they always take away too much in the registry. The more You run them on a system the sooner You have to re-install Your OS. Registrycleaners often destroy the possibility to use systemrestore.......and if You can't clean up the registry manually then You shouldn't use this either ! Use on Your own risk ! The best of its kind for free. I too have used it on xp and 7. Never had any issues. Just does the job. Thanks to the author. I personally have used this on Vista and Win7 and have never had an issue. 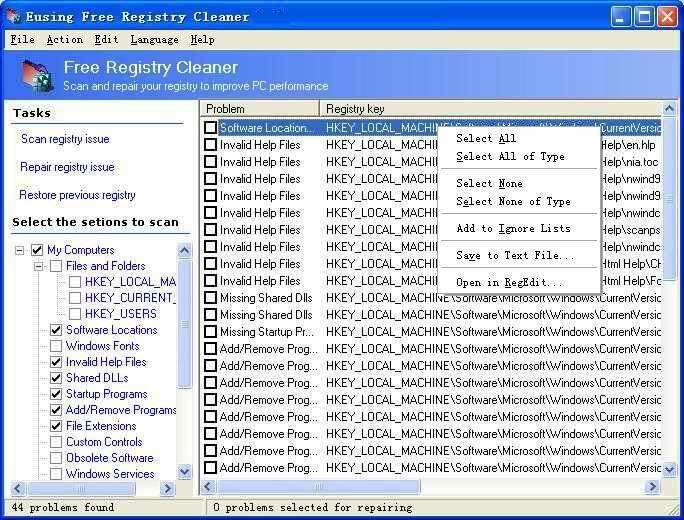 This is my preferred program to clean the registry. Like all cleaners though, you must back up the registry to be safe. I also use Eusing registry defrag after cleaning. I've been using the registry cleaners built in to Ccleaner and Advanced System Care 3 for several years now. They usually find several items every month or two when I run them. I installed the Eusing Registry Cleaner to give it a try. After making a backup of my registry, I was very suprised to see that the Eusing found 425 items in what I had assumed was a pretty clean registry. The Esuing scanned very fast and I had zero problems with it. Gotta love it. works fine, no registry cleaner is *unsafe* just take a few minutes of your time to review the results after the scan and dont delete s*** you know nothing about. I'm giving Eusing Free a 5. I've been installing EFRC on my Win 2000, XP, Vista and Win 7 computers for at least a couple of years and using it periodically (probably every couple of weeks) on each one (I have 6), and I've never had a problem with whatever it removed from the registry. That said, I'm not sure anymore that removing "errors" or bad items from the registry is very important anymore, particularly with the Vista and Win 7 Operating Systems. I suspect that the registry has become so large that subtracting 198 or even 596 out of probably 100s of thousands of items from it will speed up the computer in a noticable way. But the one thing I really like about Eusing Free can be found on the "File" Menu. On it you will find a "Startup Manager" which is much easier to use than MSCONFIG or a separate software application to manage software startups. Heck, I'd download this software just for the Starup Manager. Get it. You'll like it. And it is free as long as you are willing to click on the "Skip" button when asked for the "Registration Code". 31/12/09 09:42am SA time. I've just downloaded, installed and run Eusing Free Reg Cleaner - and so far so good. This isn't the registry defrag tool from Eusing SW! Please rtw (read, think, write). I give 5 stars because it's the best reg cleaner since years. This program has been around a good while and I've seen it recommended many times by major geek pros. The whole line of products from IoBit are worth downloading and using. Does not work well with Vista too. Hope it will be addressed in future versions.